Ingvar Kamprad in Haparanda, Sweden 2010. Feodor Ingvar Kamprad ( pronunciation (help·info); 30 March 1926 – 27 January 2018) was a Swedish business magnate. He was the founder of IKEA, a Swedish retail company specialising in furniture. 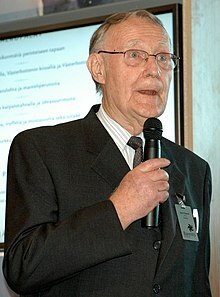 Kamprad died on 27 January 2018 in Småland, Sweden of pneumonia at the age of 91. ↑ "He lives in a bungalow, flies easyJet and 'dries out' three times a year... the man who founded Ikea and is worth £15bn". Daily Mail. London. April 14, 2008. This page was last changed on 19 July 2018, at 04:21.